Lagos State Government has donated 150 million naira to Adamawa, Borno and Yobe states towards bringing succour and relief to the internally displaced persons (IDPs) as a result of insurgency. Governor Akinwumi Ambode made the donation to the governors of the affected states at the Presidential Villa Abuja, he presented cheques of 50 million naira each to the benefiting state governments. He said Lagos state views insurgency and natural disasters as hardships that leave traumatic experiences and commiserates with the three affected states and share in their pains and discomfort. The governor commended President Buhari’s renewed commitment to bringing insurgency to a logical conclusion by the year end. “Our security agencies also deserve commendation for their gallantry, courage and resolve to ensure that the directives of Mr. President and indeed the wishes of all Nigerians is achieved” he said. According to him, though the insurgence is basically limited to the North-Eastern part of Nigeria, the effect is felt everywhere across the states of the federation. The governor called on all Nigerians including corporate organisations and other public spirited individuals to reach out at this time and alleviate the pains of the IDPs. 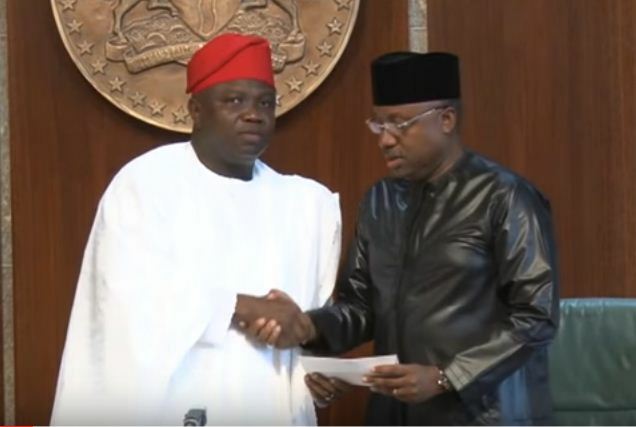 Governor Kashim Shettima of Borno, who spoke on behalf of the beneficiary state governors, thanked Ambode and the people of the Lagos state for the gesture. He assured that the funds would be judiciously used for the purpose for which it was donated.